Tony Newsom-Virr, of PlantedTanks, responds to some frequently asked questions on growing bulb plants in the aquarium. What bulb plants are best for your tank?The choice is so wide it’s really a matter of personal preference. However, you could make the wrong decision, so heed the advice of one highly successful retailer. 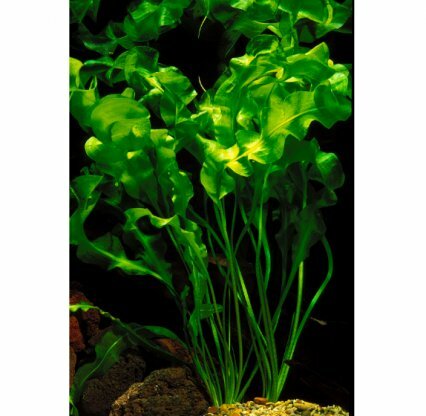 Which of the popular aquarium plants are classed as bulb plants? Among some of the more appreciated varieties to consider are: Aponogeton boivinianus, Aponogeton capuroni, Aponogeton henkelianus, Aponogeton madagascarensis, Aponogeton natans, Aponogeton stachysporus and Aponogeton ulvaceus. What conditions do they need in the aquarium? Each plant has its own ideal conditions. However, generally the Aponogeton listed here will survive in water with a pH of 6.5-7.5. The notable exceptions are A. capuroni needing pH 5.8 to 6.5, Nuphar japonica requiring 5.5-7.3 and most Nymphaea which will need 6.2- 7.2. Temperatures must generally be 22-28°C/72-82°F for tropical species, although Spatterdock can grow down to 18°C/64°F. N. japonica’s cousin Nuphar lutea grows well in UK canals, so suggesting it will survive in colder waters! Where I live in Selby, North Yorkshire, a canal only 100m/110' from my shop is littered with Nymphaea and Nuphar lilies. Which species is the best choice for the beginner? Aponogeton, like the A. ulvaceus pictured above, are easy, but be prepared. They grow alarmingly quickly and we recorded a boivinianus reaching 2.4m/8’ within three months of arrival at the shop. Obviously you get a choice of colour, green or red, but occasionally you get an oddball to appreciate and we got a brilliant pink one! Being bulb plants, they come loaded with their own nutrients for the growing season ahead, so you need to do very little except plant the bulb three-quarters deep into the substrate. Do I have to prune them — and if so how? This is preference and dependent on the type of plant you have. 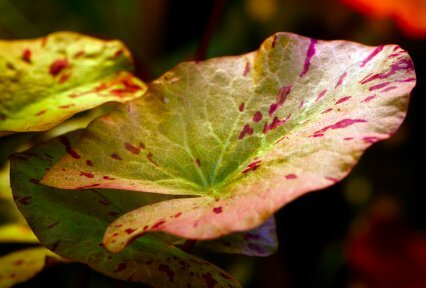 When leaves get ragged and too long on Aponogeton and Barclaya, pull them back to the bulb and cut them off close to the bulb — closer the better, so the stalk left behind does not rot and kill the bulb. You don’t really have to prune Crinum, but if you want to trim these pull them back to the bulb and peel like an onion! You decide if and when to trim Nymphaea and Nuphar. The plants will send leaves right to the surface and create shade in your aquarium. 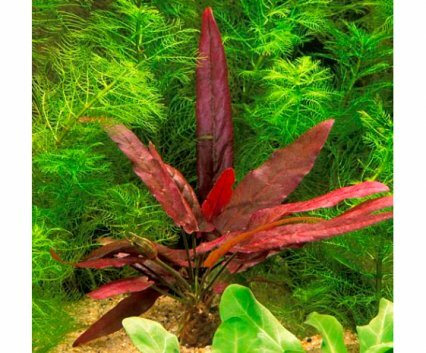 However, if you want a tight compact ball of colour under the surface then trim leaves too tall for your aquarium. Follow the stalk back to the bulb and cut it off as close as possible to the bulb. This will ensure no rot sets in and your plant will eventually reduce in size but have many leaves. I was told you need to rest bulb plants. What does this term actually mean? The purists say to rest the plants because where these grow in the wild, water heights are seasonal. During the dry season the bulbs are out of the water, the leaves die and they await the rainy season to grow again. This can rarely be achieved in an aquarium. With water always present your plants will grow all year round. However, this means you need to really feed the plants as they will soon run out and deplete the stores of nutrition in the bulb, dying off. To rest the bulb, remove from the tank and trim off any leaves. Put it in a polythene bag of damp sand and leave somewhere dry and cool to rest for around six months of the year. If we supply the plant to you it is in the growing season. This is why many bulb plants become unavailable through the year. Should I buy bulb plants as bulbs, bulbs with leaves, adult plants or just leaves? A bulb is better as it may give you several plants at the same time. As for purchasing a bulb or a bulb with leaves, this is down to your supplier. We do not supply bulb plants without leaves — instead importing them without leaves and growing them on here. This way you will know if the bulb is alive or dead. Some of my bulbs have never sprouted. How do I know if they are dead? If you ever smell an Aponogeton bulb with rot you’ll know it! It makes your entire room, as well as the water, smell rank. However some bulbs just exhaust — mainly through lack of resting. These will float, they are light and can also be squeezed. They are not firm — but a good fresh one should feel firm, be dark and sink quite slowly. Bin any bulb that oozes pus when you squeeze it. Where should they be positioned in the aquarium? Aponogetons are generally background plants — the exception being the madagascarensis which I would place midground. Nymphaea would also be midground, although N. micranthra is tiny, so this is definitely a foreground plant. Crinums, like the one pictured above, are mid to background as well. Will any bulb plants flower? Yes. Aponogetons are stunning in pink, white, purples and blues. They have really nice flowers, floating on the surface on a raised stalk. The Nymphaea flowers, although many are nocturnal so we tend to miss them. The Barclaya flower is amazing, but sadly you have to remove this before it completes setting seed or the bulb will die! The Orchid lily (Barclaya longifolia) is available in two colours, red or green, but both have a reddish hue on the underside of the leaf. It’s simple to grow, yet has not appeared in many tanks due to an apparent lack of supply in the UK until recently. The leaves have been known to grow to 81cm/32” in length, with a wavy pattern to the edges, but the green form is not as large as the red. The plant prefers a soft acidic water, both in full sun or partial shade. The water needs movement, but not a torrent, and it can be found in the slack waters of New Guinea and many parts of South-East Asia. In the aquarium it requires medium to bright lighting, especially the red form, but the green will survive and retain its coloration in either. Water must be between 22-32°C/72-90°F with pH acid to neutral and must be soft as this plant will not survive in full hardness water. RO units or peat filtration will be needed to enjoy this specimen at full potential. Barclaya longifolia is a corm, or bulbous-based plant, and this is where it stores food. It likes a good nutritious substrate, ideally clay based, but will survive in gravel or sand as long as it’s surrounded by a bed of clay-based nutrients. Planting is simple. Put the corm half in the substrate and half out, laying it on its side. Water column feeding is also required, with trace elements as a bare minimum. CO2 is not required, although it grows better with pressurised gas systems. This plant suffers from melt, like crypt melt, so, once planted, don’t move it unless necessary. If the plant suffers melt when you first get it, normally from extended transit, don’t despair. It will go into a period of dormancy but grow back strongly, being known for rapid rampant growth. This, in the correct conditions, can easily take over a full tank. Don’t pot this plant though as this will seriously damage the corm due to having reduced growing space. Propagation is easy and spreads by natural division — and the corm may produce one or more plants. Each plant will then form a new tuber or corm to store its food. It can also be propagated from seed. It flowers only at maturity and when water temperatures are as high as 30°C/86°F the seeds are easily collected. It is truly a stunning red showpiece and looks great when surrounded by a small carpet of greenery. As this is a large plant it must be provided with space to grow. During flowering periods the leaves will stop growing and, following production of seeds, the plant will go into dormancy for a few months. Don’t be tempted to move the corm at this stage as this could damage it. The new growth would then be stunted. Instead leave it to re-grow and be prepared for a stunning plant to finally emerge. Priced at only £1.51 per corm from PlantedTanks this plant comes highly recommended and certainly worth trying!